Among the true believers, everything from Apple — Macbooks, iPhones or iPads– is treated like a sacred object. 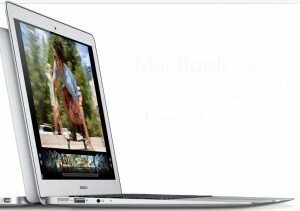 So when the new Macbook Air came out this summer, our natural skepticism raised its wary head. After a suitable hiding period, we went out and bought one. Okay, it’s great. At $999, the 11-inch Air is more expensive than just about any Windows computer, but that has pretty much always been true for Apple products, so you have to shrug it off. Once you take the big gulp and spend the money, it turns out to be a sheer joy to use. We got the cheapest model, with 64 gigabytes of flash storage. We think that’s plenty of memory. We can store photos and videos to a USB stick or move them out to the cloud. The latest MacBook Air is the lightest, most comfortable laptop we’ve ever had, perfect for traveling, and sixty percent faster than last year’s model. The keys light up and are separated, making it easier to type than any other laptop we’ve tried. The track pad lets you spread your fingers to enlarge text, pinch to reduce.Batterylife is five hours. The USB ports are version 3.0, the fastest of course. There is no hard drive, so storage is in the form of flash memory, like a USB memory stick. And the case is beautiful. You’d think it would be difficult to switch from a Windows operating system to the Mac, but it seemed natural to us. If we got confused we opened Google and queried: “How do I…?” And then we’d get the answer. One of the often touted advantages of the Mac is security. The talk is you don’t need to buy an anti-virus program or do regular maintenance chores if you exercise ordinary caution. What kind of caution? The kind that applies to PCs as well: Don’t open email attachments from unknown sources, don’t install pirated software, don’t visit questionable websites, and turn on the firewall, which is off initially. We soon realized we didn’t need to buy new software for this machine. The “Text Editor” that comes with the Macbook Air lets you save whatever you write as a Word document and works much like Word. We downloaded the free Picasa from Google for photo editing, though the Air has its own photo editor. We’re still mainly Windows users, but for traveling the Air is great.